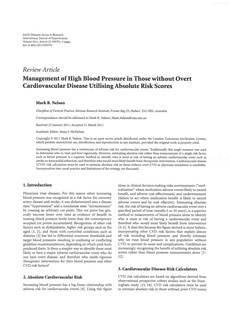 Increasing blood pressure has a continuum of adverse risk for cardiovascular events. Traditionally this single measure was used to determine who to treat and how vigorously. However, estimating absolute risk rather than measurement of a single risk factor such as blood pressure is a superior method to identify who is most at risk of having an adverse cardiovascular event such as stroke or myocardial infarction, and therefore who wouldmost likely benefit fromtherapeutic intervention. Cardiovascular disease (CVD) risk calculators must be used to estimate absolute risk in those without overt CVD as physician estimation is unreliable. Incorporation into usual practice and limitations of the strategy are discussed.